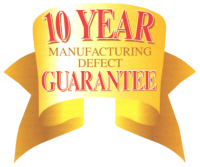 We pride ourselves on supplying quality products, and are pleased to offer the following guarantees on our products: 10 Year Manufacturing Defect Warranty on all Hardwood, Oak, Walnut, Veneer Flush and Pine door products. 1 Year Manufacturer's Defect Warranty on Gates, Frames, White Moulded and White Primed Doors This warranty extends and is available only to the first retail purchaser of the door(s) and is not available and may not be enforced by any person to whom such door(s) are transferred by such a purchaser. Subject as expressly provided in these terms, and except where the doors are sold to a person dealing as a consumer (within the meaning of the Unfair Contract Terms Act 1977), all warranties, conditions or other terms implied by statute or common law are excluded to the fullest extent permitted by law. Where the doors are sold under a consumer transaction as defined by the Customer Transaction (Restrictions on Statements) Order 1976 the statutory rights of the purchaser are not affected by these terms. The following matters are also excluded from this warranty: Unsatisfactory service or appearance or any other defect caused by failure to follow recommended handling, fitting finishing and maintenance instructions. The appearance of field finished doors is not warranted in any event. Natural variations in the colour or texture of wood shall not be considered as defects. Warp, twist cup or bow shall not be considered a defect unless they exceed the following tolerances: Warp, 6mm in the plane of the door itself; Cup, 2mm across the width of the door; Bow, 4mm along the length of the door. Any warranty against warp does not apply in any event to the following: all doors which are wider than 914mm, or higher than 2,134mm doors that are improperly hung or do not swing freely. Delamination caused by failure to protect and seal all exposed surfaces of the door including failure to lacquer top and bottom edges of the door. In respect of doors covered by this warranty, the manufacture may, as its option and in its sole discretion, either repair the door(s) without charge or replace the door(s) without charge, in the same state of fitting and/or finishing as was originally supplied and the manufacturer shall have no further liability whatsoever to the purchaser. All Guarantees are subject to the door or product being prepared, installed and treated in accordance with our recommendations for Installation, Finishing and Care, detailed on the door label (also available on the website - please see the 'Supplier Recommendations' section on the Technical page of our website). Subject to the terms set out below, the manufacturer warrants that all doors (except those expressly excluded from this warranty) shall be free from defects in material and workmanship which would render the said doors unserviceable or unfit for their ordinary, recommended use, for a period of ten years from the date of purchase. All ironmongery products on this site carry a one year guarantee unless otherwise stated. For example, our Hi-Load hinges have a 25 year guarantee and many other products including our brass handles carry a 10 year mechanical guarantee.